Cansford Laboratories are a state-of-the-art Hair and Oral Fluid Drug and Alcohol Testing Lab based in the UK. 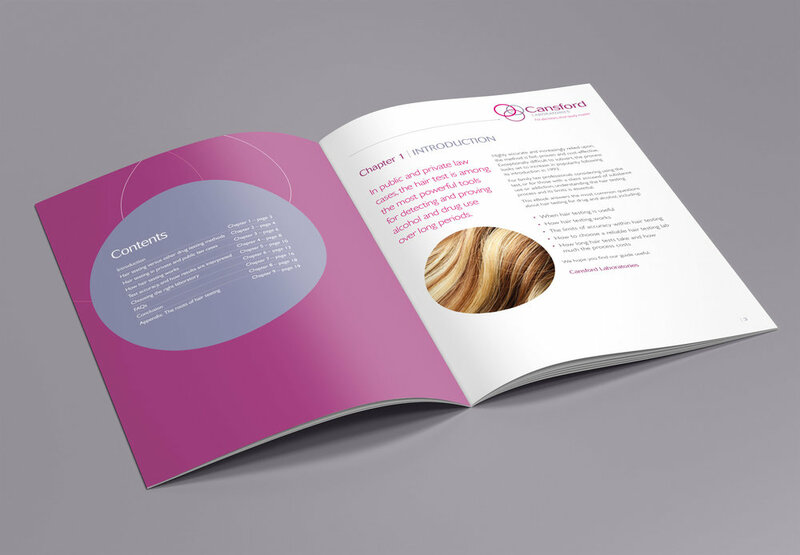 Their team pioneered hair testing 25 years ago and today offer a modern, fast and class-leading service, which is admissible as evidence in a court of law. I was contacted by Bristol content marketing agency Future Content. Their copywriters were working with Cansford Laboratories on content for the e-book, but Future Content didn’t have any in-house design capability. I’d met Stuart Roberts from Future Content at a couple of networking events in the past, so luckily for me, I was on his radar. Cansford Laboratories had an old e-book that no longer conveyed the information they needed it to. The other issue they had, was that it wasn’t conveying the Cansford brand strongly enough, or in a consistent manner. 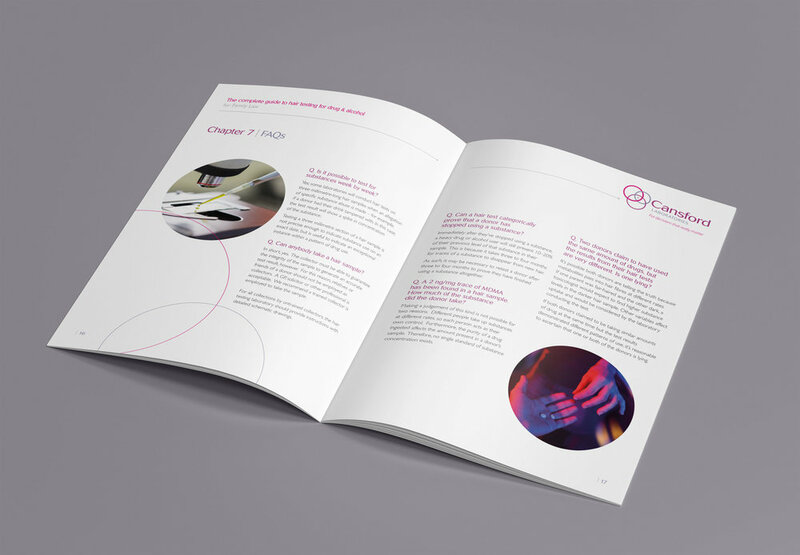 By collaborating on this project, we hoped to design an e-book which would talk to Cansford’s target audience in exactly the right way, whilst also being bang on-brand. 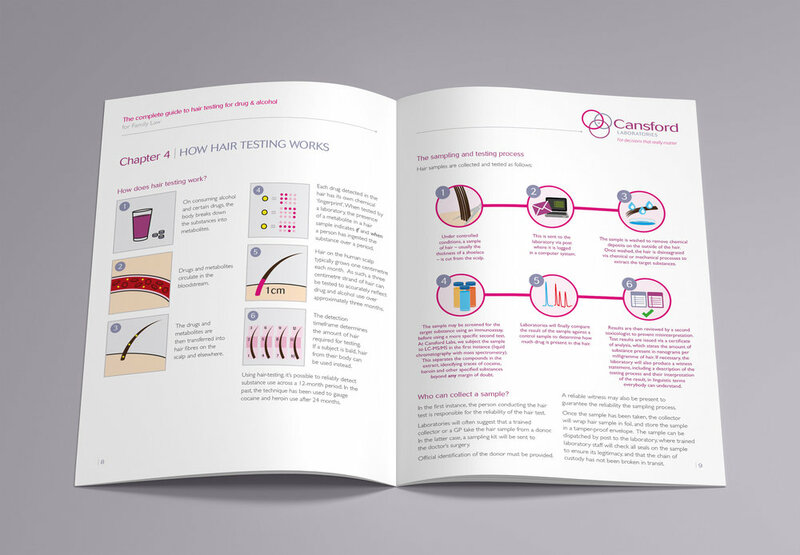 To demonstrate how hair testing works, as well as the sampling and testing process, I created bespoke infographic illustrations. This was a far more interesting and engaging way of demonstrating the process, than a page of pure copy alone. Whilst the subject matter of the e-book was quite niche, I managed to find accompanying photographic imagery on royalty free stock image libraries. This worked well both creatively and in terms of the client’s budget. I designed the e-book as an A4 20 page brochure, with the thought in mind that Cansford could also get hard copies printed, without having to commission a separate design. The digital version is available to download as a pdf from their website. An A5 version of the e-book has already been printed and received well at an event attended by Cansford Laboratories.